From AWM President Ruth Charney’s column in the Sept-Oct 2014 AWM Newsletter. 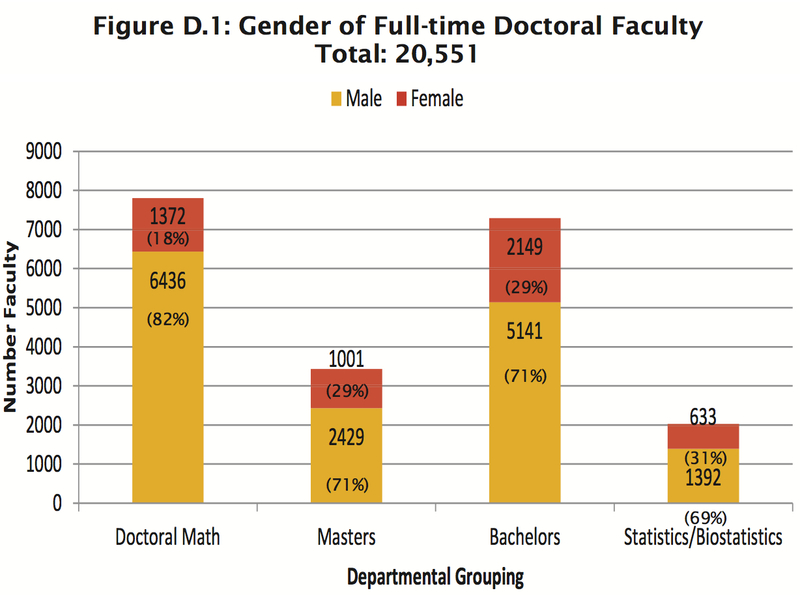 Looking farther down the academic pipeline, only about 12% of tenured faculty at doctoral institutions are women, while around 29% of full-time faculty are women, combined across all institution types, according to the 2012-13 Departmental Profile Report. Salary disparities continue, with women faculty earning on average about 81-83% what men do on average across academic institutions. According to the NEA Higher Education Advocate (March 2014), women faculty at private doctoral institutions had an average salary of $81,293 compared to $103,591 for men in 2012-13. The situation is still inequitable but less so at liberal art institutions, with women faculty earning around 90% what men do.